So I called her. Mary and I spoke about the book about how she reads with the use of a magnifying glass (instead of large print editions or eReaders) and really hit it off. Later, I’d call to see if she would allow us to use her letter in an ad. (We did. And the book soon became a #1 Globe and Mail bestseller). This week Mary is turning 100 and she won’t escape celebrating after all. We’ve invited her into the office to celebrate with a birthday party the whole office will attend. Mary doesn’t drink so we’ll have juice and we’ll spell out “100” in cupcakes to celebrate both her birthday and the book that brought us all together. In fact, Jonas Jonasson has replied to Mary’s letter and we’ve produced a special, one-of-a-kind hardcover edition with both the author’s and Mary’s letter printed inside just for her. In the intervening months I’ve heard from some of her family what our friendship has meant to her but I don’t think Mary knows what it has meant to me–and everyone I speak to about her. It’d be easy to say that Mary became a fill-in grandmother for me but she’s also a fellow book lover and a friend–sometimes we don’t even talk about books. I love her spirit, her self-effacing humour, how indomitable she is and wish everyone had the chance to meet her. For more pictures from Mary’s 100th birthday party, check out the slideshow below. Celebrating 5,000+ 50 Book Pledgers! Okay, this is fantastic. I’m so happy you shared this, as it’s really made my day. Awww! I’m tearing up here! Lovely story. Aww, this is absolutely adorable! This definitely made my day, you are awesome! YAY!!! Happy, happy birthday, Mary!! Thank you for doing this, Cory (and all the awesome HCC employees!!). I have wondered about Mary, since you shared her letter last year, and I am so glad to read about your developing friendship with her, and Mr. Jonasson’s appreciation. The special edition you created is lovely. I am sure it will be treasured. Thanks Jennifer. She’s really reminded us of why we’re in the book business! Cory, you are amazing! You have given my grandmother one of the BEST gifts she has probably ever received in her life. Turning 100 (and living on her own!) is such a feat, never mind looking so great, being so witty and having the energy that she does. The fact that you have celebrated her life and her whole persona is fantastic. She has been through many things in her life (many we hope never to experience). Thank you so much for your generosity, love and kindness. May we all live to be remotely as amazing as (who we call) “GG” (for Great Grandmother). It is more than our pleasure–trust me. Your Great Grandma is a really special lady who means a lot to us. I really do love her spirit (and wit!) and I think she’s got a place in the office Hall of Fame now. She’s really reminded us of the best part of our business. Happy Birthday Mary!! What a lovely thing you did for Mary, Cory. I remembering reading her letter when you first talked about it. It brought a smile to my face and a tear to my eye. But today, reading about your friendship with Mary over the last little while, and the obvious caring you both feel for each other, it made my heart fill up with joy. Thank you so much for sharing this amazing story. Both you and Mary are class acts. 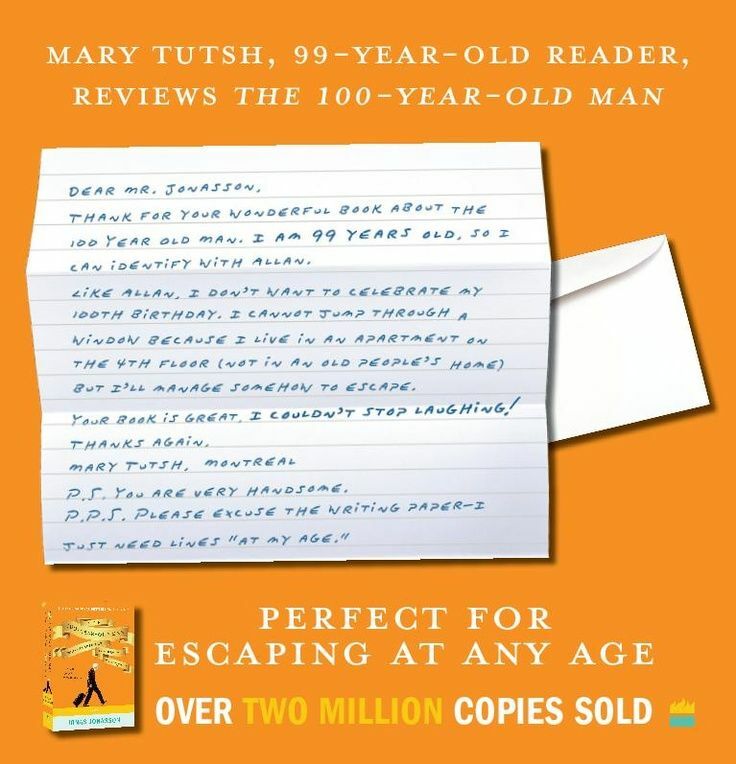 It was lovely to see how much Mary’s letter was appreciated by Mr. Jonasson and that he took the time to write her a personal note, that went with the specially bound copy of The Hundred Year Old Man. Awesome! Thanks Mary Ellen. I’m glad you liked it. She’s a great, great person. Definitely lucky to know her. Such a wonderful and inspiring story! Books do span the ages don’t they? Happy Birthday Mary! Thanks Steph. I’m happy everyone is getting to know her. Absolutely loved your story Cory! Yes books do connect people across age, language, social status and so many other things. Years ago when I left my own country and landed on a different continent with no family and friends in all these moments when I felt really lonely I always went to the bookshops. I looked at all these books that I recognized from years of reading at home and I immediately felt at home. I had a point of reference and a point in common with all those new books and new readers in this new to me country. A lot of my best friends are people whom I met through my love of reading. It is so so true, Anna. Easy to forget sometimes so I’m really grateful when someone like Mary finds a way to remind me. What a wonderful story! Thanks for sharing it with us, Cory. A happy belated birthday to Mary.